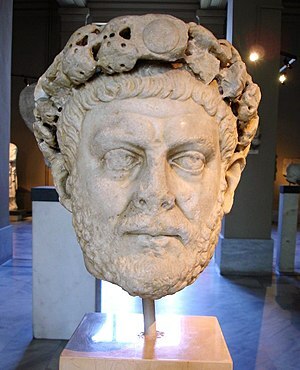 In the year 303 the Emperor Diocletian issued an edict ordering the ‘demolition of all churches, the burning of their books and the removal of all Christians who held public office. Other edicts, which quickly followed, ordered the death of all Christians who would not offer sacrifice to the Roman gods. This persecution lasted for the next ten years, but the Christians of Britain were more fortunate than their brethren in many countries for, after the initial fervour of the first two or three years, the Roman governors in Britain, far from the eagle eye of their wrathful emperor, began to relax their pursuit of the Christians. Among the many martyrs who suffered in Britain 111 the Diocletian persecution were four who are of particular interest to us in this area: our patron saints, Julius and Aaron: Alban, the British proto-martyr ; and his companion, the priest Amphibalus, a native of Caerleon, The nationality of Julius and Aaron is not clear, but there is no doubt at all that they were citizens of Caerleon. Some say that they were British, but the more popular belief is that they were Roman soldiers. Rice Rees, in his “Essays on the Welsh Saints”, says: “They appear to have been Romans rather than Britons, which may account for the circumstance of their having passed almost unregarded by the Welsh people.” S. Barings Gould points out that their feast day occurs in the old Roman martyrology, but is not to be found in the Sarum or York Calendars.